Today, I learned about this incredible dining experience, and as a wanna-be-foodie, I couldn't help but be intrigued. First thing I thought was: Leave it to Las Vegas to take something as simple as dinner and make it into a life-threatening, heart-dropping, stomach-churning experience. Enter: Dinner in the Sky. I poked around a little more into the phenomenon, and found that Sin City isn't such an innovator, after all! The newest addition to Sin City's roster of unique consumer experiences has actually debuted in a number of other cities and 40 countries around the world! This news sparked my curiosity: What are some of the other crazy dining experiences that I've never heard of? Here's what I uncovered! It's a well known fact that if you suppress one sense, the other will become heightened. Therein lies the premise surrounding dark dining. Popular around the world (from LA to Paris, and beyond), diners trust their servers and chefs wholeheartedly. If you're the type who suspects someone spit in your food because you complained, these joints probably aren't for you. Opaque (LA, Santa Monica, San Diego, and San Francisco), welcomes guests into a lit area where you order your food and check your belongings. You're then guided into a pitch-black dining room by blind or visually impaired servers. Blindehuk in Zurich is said to be the world's first dark dining restaurant (a non-permanent restaurant supposedly started the movement in Paris during the same year). Their menu changes weekly and they, too, employ partially sighted or blind staff. Sure, humans are imperfect. But can a robot truly understand that your meat hasn't been cooked enough, or that your water has a fly in it? The owners of Hajime Robot Restaurant in Bangkok, Thailand will probably tell you yes, they can, and do. 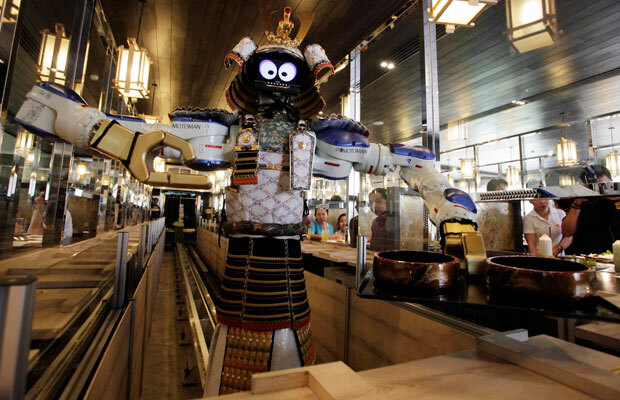 The restaurant's robots serve you from a vast menu of over 100 items. Possibly the best part? The robots can dance along to a rhythm. So not only are they cooking your food, serving you, and clearing your tables (they're programmed to do so automatically when there's an empty plate), but they also have some dance moves! 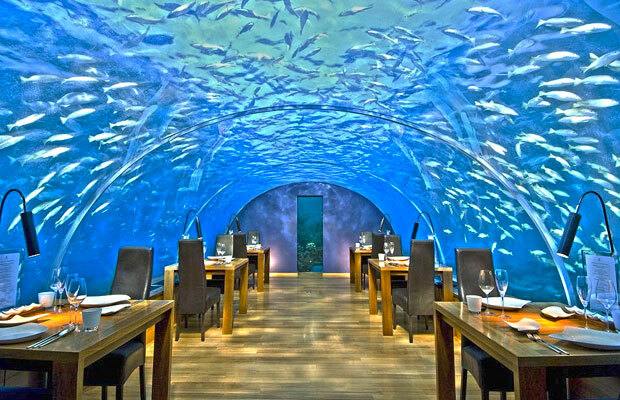 The underwater restaurant to visit is Ithaa, and you can see why. Set at the Conrad's Maldives Rangali Island outpost, Ithaa is situated below 16 feet of water. Diners enjoy 180 degree panoramic views of tropical fish, sharks, and more sea life. And while the contemporary European cuisine seems a bit out of place for the South Pacific restaurant, I'm not really bothered by it, especially when it comes served up with wine pairings and no kids allowed during dinner. If you're at all afraid of heights, Fangweng Restaurant in China's Hubei Province might be one to skip on this list. 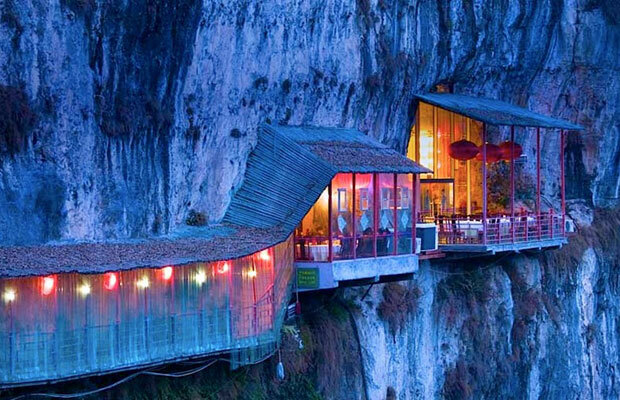 The restaurant seems to hang on by a thread from a rock face over the Chang Jiang River. It's located about 7.5 miles north of Yichang in the Happy Valley of the Xiling Gorge. The area is known for its scenic stretches of cliffs, caves (most notably Sanyou Cave), and park land. Ever had a curiosity of what it might be like to spend some time behind bars? Alcatraz E.R. in Tokyo, Japan is a good way to find out without straying too far from the law. The restaurant, fashioned after a nightmarish prison hospital, welcomes diners by hand-cuffing them. You're served in cells from a menu of questionably labelled items (human intestines?). On the other end of the spectrum is Great Escape Restaurant in Salem, Massachusetts. 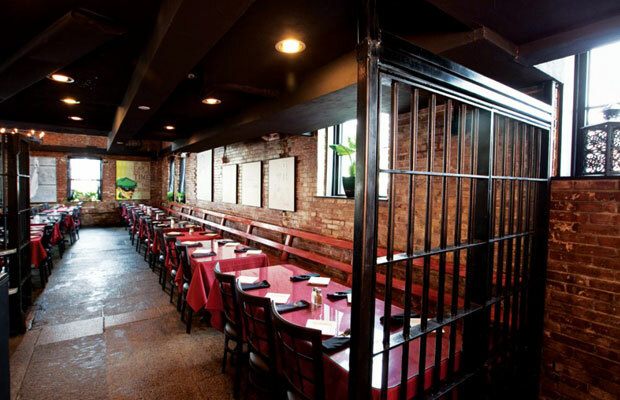 Housed in what used to be America's oldest active jail (from 1813 to 1991), the restaurant features much of the original architecture (brick walls, cage details, etc.) and serves up-scale fare with pretty kitschy names (Mafia Steak, anyone?). Most of us would probably prefer to avoid eating on airplanes as much as possible, but I won't be the first to say that enjoying old-school diner fare on a Boeing KC-97 tanker plane sounds pretty cool. 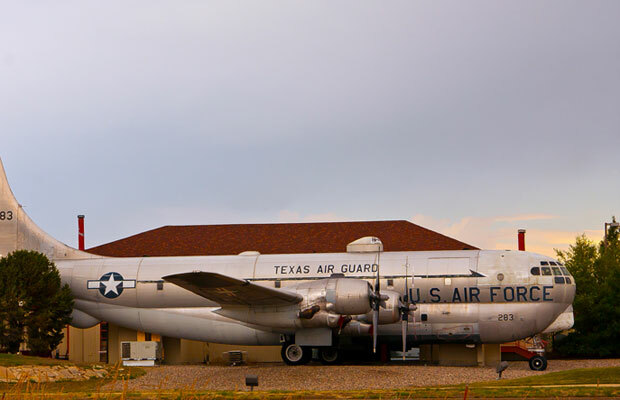 Situated adjacent to the Radisson Hotel Colorado Springs, The Airplane Restaurant (I know, really original name), built in 1953, once served as a flying fuel tank for other planes. Today, 42 people can enjoy everything from baked spaghetti to shrimp alfredo and baby back ribs. Memorabilia, photos, and aviation artifacts decorate the interior. If you've never stayed at an ice hotel – or rather, prefer not to spend your night freezing – an ice restaurant is a good second best to the experience. And IceBar at Snow Village in Finland is a good place to start. 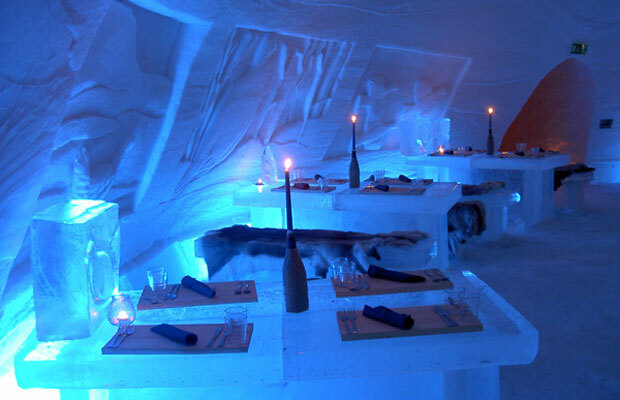 The restaurant is carved out of naturally forming ice (it is Finland, folks) and is kept at a cool 23 to 28 degrees Fahrenheit. What is the craziest restaurant you've ever been to?